Objective: To build unison on policies and a consolidated idea to achieve universal Financial inclusion in India. Theme: "Financial Inclusion is not an option but a compulsion”. A Financial inclusion meaning according to the world bank is that people and businesses have access to valuable and affordable financial products and services which meet their needs like financial transactions, payments, savings, credit and insurance which delivered resources. This summit gives a stage to provide plenty of information to all the leaders and business masters to think and discuss the issues and challenges of financial inclusion in an India. 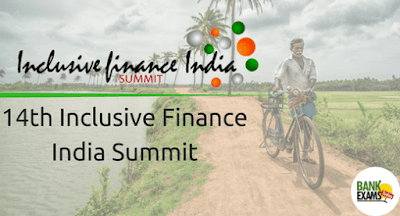 This is a two-day summit organized to release and present "Inclusive finance India Report" which gives an insightful interpretation and reliable review of the financial inclusion progress report of the last year. The summit will deal issues related to financial inclusion. Financial education and financial stability and to achieve the vision "Financial Inclusion Vision 2020"
Financial Inclusion includes financial services and targets banking sector to make it real by considering National level policy and this will help to plan, discuss and give direction to change the economy. The summit invites and attracts more than 1000 representatives within India and Outside of India because it is the biggest conglomeration of financial inclusion. In this two day summit, there are 90 experts or leaders were invited from all over the world to discuss, plan and think on the development of financial inclusion in the country by highlighting many trends and difficulties. The emphasis is given to technological shift in the financial inclusion aspect of Direct Benefit Transfer (DBT) and UPI (Unified Payment Interface). Financial inclusion is a key tool with the biggest potential for a progress of economic and social. To achieve this mission, An ACCESS is set as a medium agency which enables poor men to access resources, knowledge, banking, markets and entitlements effectively. This generates composite forms which are sustainable and outlines "lift and shift" policy which can be replicated beyond circumstances and domains. An ACCESS model concentrate on uniting financial value chain by coordinating demand and supply chain. ACCESS nurtures developing MFIs and strengthens its ability to help them upscale in services, heighten its portfolio and meet the growing demand among poor communities. An ACCESS model tries to facilitate on-lending fund flows from financial companies through a *ACCESS Microfinance Alliance platform (AFA) that includes more than 130 MFI allies, reaching out to 3.9 million customers. At the India Level, ACCESS model aims to support by providing infrastructure facility, environment to stakeholders to solve problems related to financial services facing the poor sector. An aim is to highlight problems and hurdles related to the development of financial inclusion and microfinance services to the lower class people in India by forming the policy to generate favourable circumstances in the financial value chain. The summit helps to form a system which combines all attempts and give an aggregate outcome by bringing global association of stakeholders.